Definition: Ledger implies the principal books of accounts, wherein all accounts, i.e. personal, real and nominal are maintained. After recording the transactions in the journal, the transactions are classified and grouped as per their title, and so all the transactions of similar type into are put in a particular account. Individual accounts are to be opened in ledger book for each group, i.e. purchases, sales, cash etc. and the entries from the journal are posted to their account. It should be kept in mind that the account name used in ledger should be the same used in the journal. In the date column, we enter the date of the transaction. While posting the entries in the debit side, we add the prefix ‘To’ with the concerned accounts posted in the particulars column and the prefix ‘by’ is used with the accounts entered in the particulars column of the credit part. When it comes to posting the entries, the accounts debited in the journal are to be debited in the ledger, however, reference is given to the concerned credit account. The accounts are balanced at the end of each month or financial year. And to do so both the sides are totalled first and then the difference between the two sides is ascertained. This difference is called the balance, which is added to the side which falls short. When the credit side is greater than the debit side, it is called a credit balance which is indicated as ‘To balance c/d’.On the other hand, when the debit side is in excess of the credit side it is termed as debit balance, which is indicated as ‘By balance c/d’. Here, the word c/d refers to carried down. Similarly while opening the account for the next month or period. The balance on the debit balance is taken to the debit side as ‘To Balance b/d’ and vice versa. The word ‘b/d’ expands to brought down. In the folio column, we will enter the page number of the journal from which entry is posted to the ledger. The amount column is filled with the respective amount against the entry. Personal Ledger: Personal Ledger, implies the ledger that records details of every transaction about the persons, concerned with the accounting unit. Debtors Ledger: Debtors are the persons to whom goods are sold. So, it includes the accounts of individual trade debtors of the entity are covered in this category. Creditors Ledger: Creditors are the persons or firm from whom we purchase the goods. So, it encompasses the accounts of individual trade creditors of the business enterprise. Cash Book: It is the book that contains all the cash and bank transactions. Nominal Ledger: The ledger accounts relating to incomes such as Sales A/c, Rent received A/c, Commission earned A/c, Interest received A/c, etc. and expenses such as Wages A/c, Salaries A/c, Purchases A/c, Electricity A/c. Rent Paid A/c, Commission Paid A/c, etc. are covered in this category. 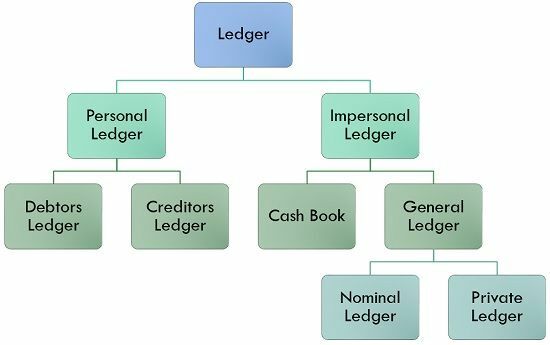 Private Ledger: The ledger in which entries concerned with assets and liabilities are entered is called Private Ledger. Ledger is the King of all Books and that is why it is also known as the book of final entry wherein account-wise balance of each account is ascertained. It helps in the preparation of trial balance and financial statement, i.e. profit & loss account, balance sheet, and cash flow statement.